There are sudden and organized types of attack. 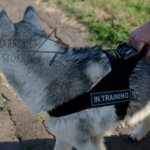 Dog training is always started with a sudden attack when a dog trainer is hidden behind a blind. 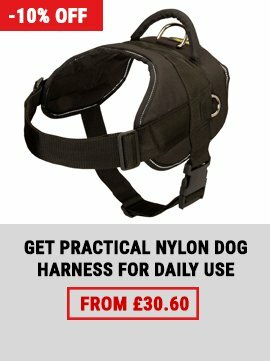 Dog owner leads a dog on a leash to a training ground, walks for a while with the dog and then goes to the blind. The dog trainer flings out of the blind and makes ominous gestures when the owner and the dog are about at a distance of 20 meters. The owner says "Go!" and runs together with the dog towards the trainer. The owner may release the leash or not. 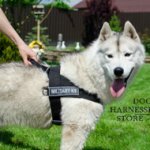 If the dog isn't frightened and it moves without hesitation, then it's better to unfasten the leash from the first training so that the dog hadn't got used to rely upon the owner's support having a contact with him (her) through the leash. 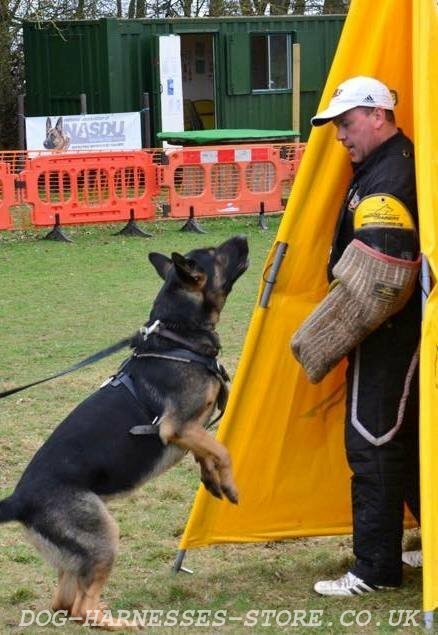 The dog is given a bite sleeve and praised by the owner after continuous struggle and some shocks of a stick. The distance between the owner and the dog should be increased training by training. 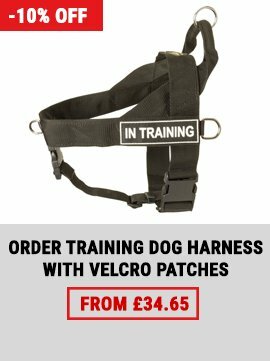 Finally, the owner should stay up at the moment when the trainer is appeared from behind the blind to give the dog an opportunity of being on the trainer's track alone. The next stage is an organized attack. The dog being off the leash stands alongside the owner, the trainer makes some ominous gestures and runs away. The dog chases the trainer. 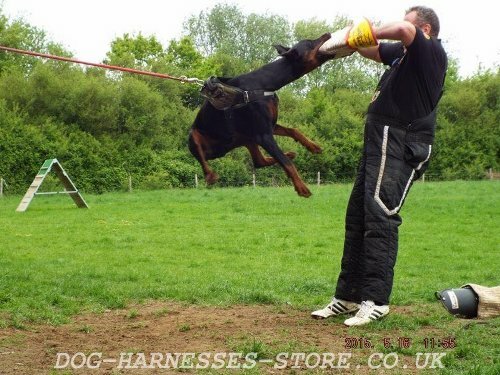 The trainer turns round and runs towards the dog running over several meters. The dog wins and gets a sleeve as a reward. 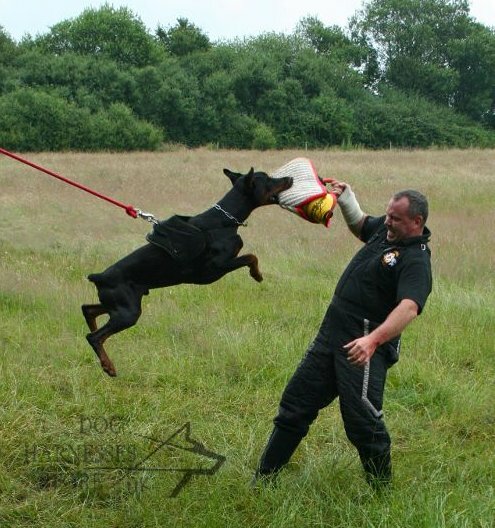 The final stage of attack training before protection and obedience training is scouting. The dog should be trained to examine hiding places for dog trainer searching and bark him after he had been founded. 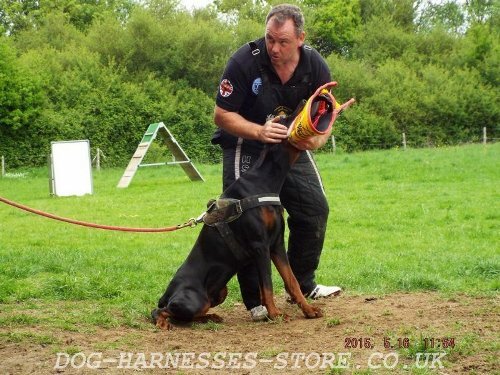 The dog should attack the trainer only when he tries to run away or threaten the dog. 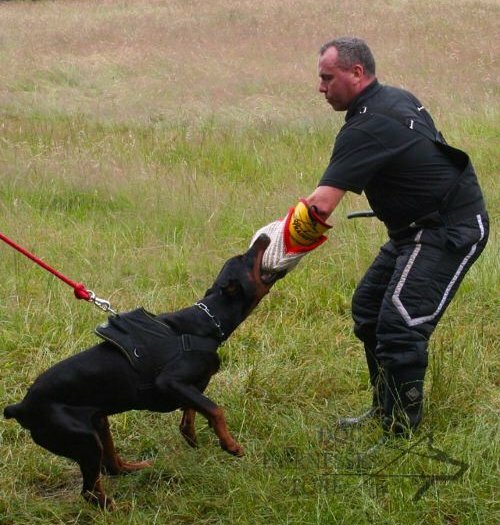 The training is started when the trainer makes a threat posture while the dog and its owner are outside. 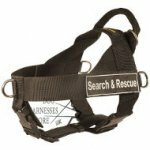 Then the owner leads the dog to the place where it can't see the trainer while he goes beyond the training ground from the other side. The owner and the dog come back to the training ground. The dog is sure that the trainer is in a certain place. The trainer gives a command "Seek!" and rung together with the dog to the nearest blind showing the direction by hand. The dog of course didn't find the trainer. Then the owner calls the dog gives the command "Seek!" again and directs it to the second blind. The owner comes up to the dog and stops with it behind of the blinds after several fail attempts to find the trainer as if it wants to help the dog. Actually, the owner does this to prevent the dog from seeing the trainer, which comes back on the training ground and hides behind one of the blinds at this moment. The trainer makes a neutral posture. The owner gives a command "Bark!". 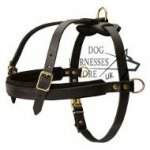 If the dog tries to bite the trainer, the owner keeps the dog by pulling the leash and, if necessary, even making a strong jerk. If the dog starts barking it is rewarded and praised. 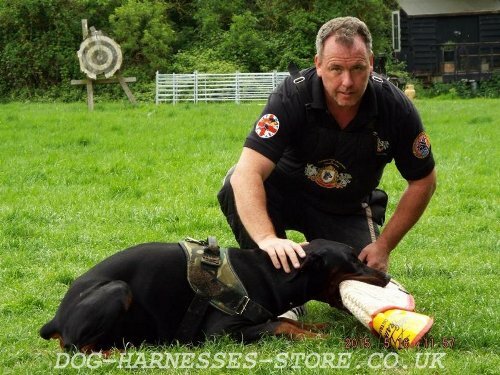 The dog can attack the trainer only if he tries to run away or shows aggression. It's better to practice at the following lessons so that the dog didn't forget about its mission. 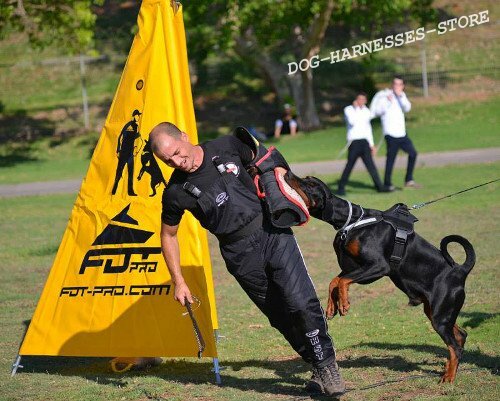 The dog is trained of a proper respond to various trainer's actions at further stages of dog training. 1. If the trainer stands still in his blind, the dog should only bark him. 2. If the trainer starts moving without making ominous gestures, the dog should become alarmed. 3. 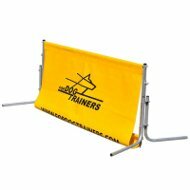 If the trainer makes a threat posture or tries to run away, he should be attacked. 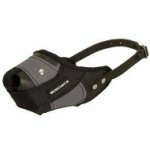 Dog obedience together with protection should be trained at this stage of dog training. 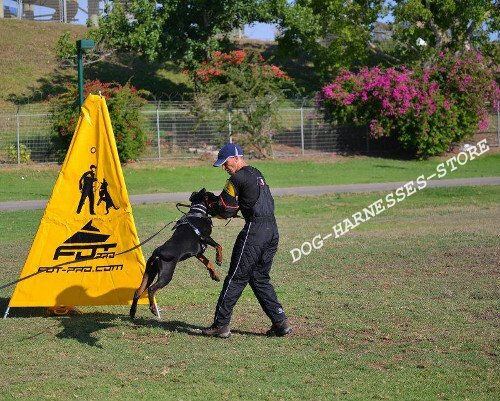 The most important is to train the dog to run the command "Leave It! ", which is rather difficult to follow for the dogs with martial spirit. 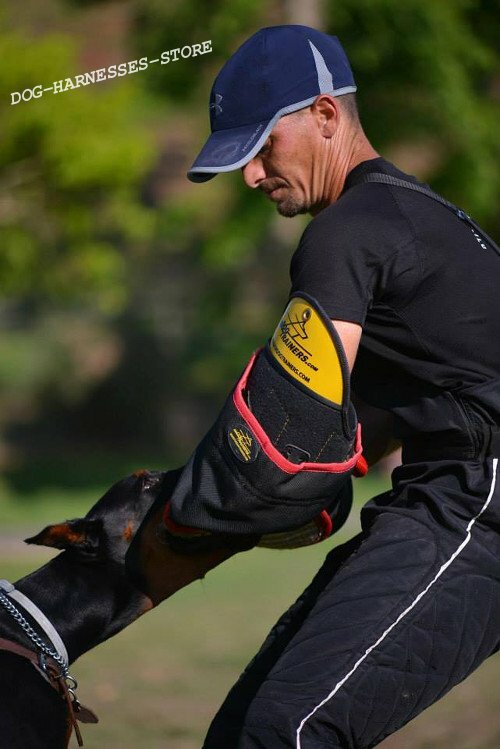 The dog should leave the sleeve when the trainer has stopped a struggle and stood still. The dog opens its mouth without thinking when hears the command "Leave It" in most cases because it got used to do it like that during fetch training. 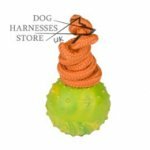 However, dog's attack instinct may be stronger and the owner has to pull on the leash to make the dog to loosen its grip. 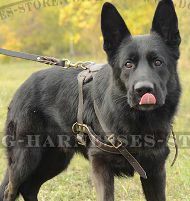 Alertness during frisk search and further convoy are also the skills which the dog should be trained. 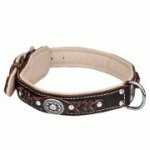 This refers to obedience exercises, which the dog should do perfectly. 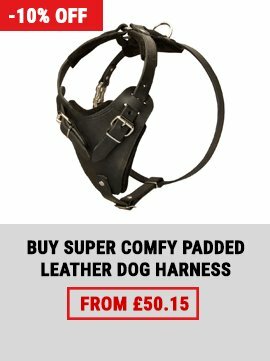 The dog should run the command "Down!" and go off the leash flawlessly. 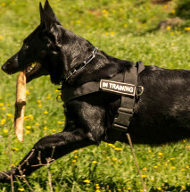 But it's very difficult for the dog to do these exercises in the presence of a person, which plays the role of trespasser because the dog is excited and it would rather bite him then to obey the owner. However, time and patience will give excellent results in this situation. 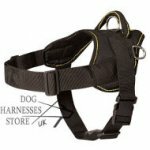 Choose the best training equipment at our online dog store! 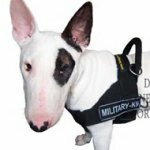 Read also about guard dog training.